Nnedi Okorafor is an accomplished author of speculative fiction. 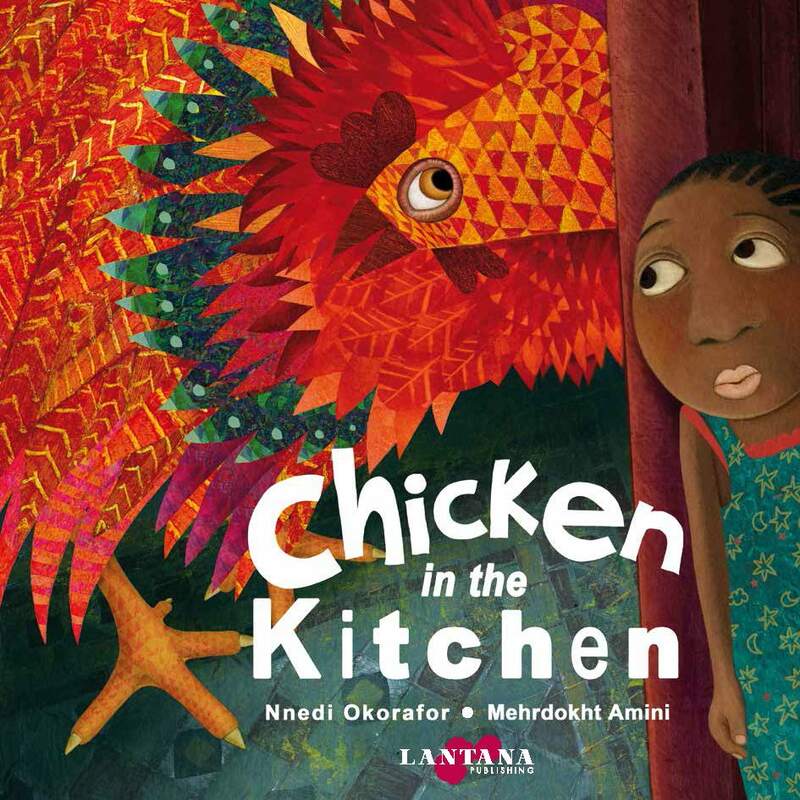 Chicken in the Kitchen, her first picture book, reflects her talent for intrigue, her Nigerian roots and her Igbo heritage. Her skill with words is matched by illustrator Mehrdokht Amini’s large, colorful images that burst off the pages. The story begins on the eve of the annual New Yam Festival. Young Anyango is asleep in her bedroom when she hears noises. With trepidation she creeps into the kitchen where she confronts a giant chicken who is trying to steal yams. A friendly nature spirit called Wood Wit appears and gives Anyango advice. Buoyed by Wood Wit’s support, Anyango befriends the chicken and they dance together before the chicken disappears. The reader is left to ponder what happened to the chicken. Why didn’t it show up the next day for the yam festival? Or did it? The ending opens the door to imagination and questions. The illustrations will help kids find answers. This is a story of friendship – between Anyaugo and Wood Wit, and between Anyaugo and the chicken. It is a story about culture, particularly the religious beliefs embodied in the masquerade celebration of the Igbo New Yam Festival. The story also introduces a Yoruba name, Anyaugo, which means eye of the eagle that sees everything. The illustrations throughout the book emphasize her eyes and could be attributed to the fact that she is very observant of developments around her. The illustration on the next to last page is instructive. To the left we see two couples in traditional dress symbolizing gender parity in the production of yams; to the right musicians, also in traditional dress, play local instruments. The backdrop shows a town with houses and apartments rather than a rural setting. The children attending the masquerade sport Western dress and local designs. I highly recommend this book for children in grades K-3. It provides lessons to be learned about friendship, following directions, respect, responsibility, and courage. Reviewed by Sussie Okoro, Ph.D.